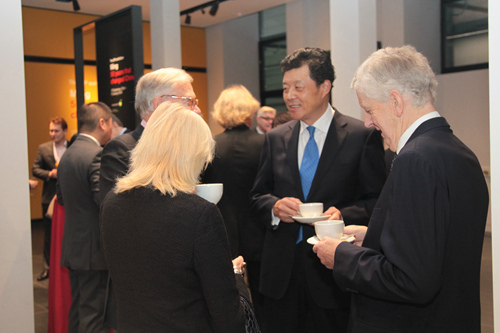 Chinese Embassy Breakfast for "Ming: 50 Years that Changed China"
On 16 December, Chinese Embassy breakfast for "Ming: 50 Years that Changed China" was hosted by Ambassador Liu Xiaoming at the British Museum. Guests included Johnathan Williams, Deputy Director of the British Museum, Lord Bates, Deputy Speaker of the House of Lords, Lord Charles Powell, Private Secretary and foreign policy advisor to former Prime Minister Margaret Thatcher, Lord Neil Davidson, Shadow Secretary of State for Justice and Finance of the Labour Party, Sir Henry Keswick, Chairman of Jardine Matheson Holdings Ltd., Chris Evans, Editor of the Daily Telegraph, Russian Ambassador Alexander Yakovenko and his wife. 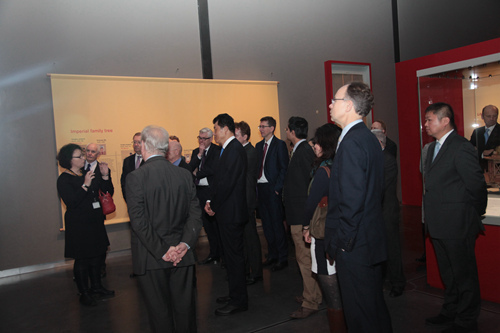 The breakfast was followed by a private view of the exhibition Ming: 50 Years that Changed China. In his passionate speech, Ambassador Liu Xiaoming applauded the fact that, this year, two great British museums – the British Museum and National Museums Scotland- presented large exhibitions on the same subject – the Ming Dynasty. The Ming Dynasty was a golden age in Chinese history. It was a period of political stability, advanced economy and prosperous culture. In terms of external relations, China during the Ming Dynasty embarked on unprecedented exchanges with the world. Zheng He led his great fleet on seven expeditions down the "western seas". Those were missions of peace. They sowed seeds of friendship, promoted economic and cultural exchanges and fostered harmony between China and the world. Ambassador Liu pointed out that today, China is in a new golden age. China's relationship with the rest of the world is undergoing more profound changes. Its close connection and interaction with the world is unprecedented. As China becomes increasingly dependent on the world and deepens its participation in world affairs, the world's dependence and influence on China is also deepening. This exhibition at the British Museum is not only about the past. It is not merely an opportunity to appreciate the exquisite Chinese antiques six hundred years ago. It is also about today. It inspires understanding of today's China and its development path to achieve the Chinese Dream. Ambassador Liu said, the "Chinese Dream" advocated by President Xi Jinping is about the great renewal of the Chinese nation. China had its glories in the past. China is creating new splendour today. It has embarked on a road to national rejuvenation. This is a road that leads to prosperity of the country and better life for the people. What China follows is a path of peaceful development. What the "Chinese Dream" advocates are peace, development and win-win cooperation. What we pursue is both the wellbeing of the Chinese people and the common good for people of all countries in the world. China had made important contribution to world civilization and human progress in history. Today, China will continue to do its utmost for world peace and prosperity. Deputy Director Johnathan Williams of the British Museum thanked the Chinese Embassy for its continued support for the British Museum, especially the Embassy's assistance during the preparations for the exhibition Ming: 50 Years that Changed China. The year 2015 will be a year of UK-China cultural exchange. The British Museum will continue to strengthen cooperation with China to facilitate bilateral cultural exchanges and jointly create a better future. Ms. Jessica Harrison-Hall, Keeper of the Department of Asia of the British Museum and Curator of the exhibition Ming: 50 Years that Changed China briefed the guests on the preparations for the exhibition, accompanied them during the view and explained the key exhibits. Ming: 50 Years that Changed China is another major exhibition focusing on China presented by the British Museum following the exhibition The First Emperor: China's Terracotta Army seven years ago. After nearly five years of preparations, it brings together 280 objects from museums around the world, with over 100 of its exhibits on loan from more than 10 museums in China. The exhibition runs through 5 January 2015.